Mothers Day is the second Sunday in May in Australia. You can find out more about this special day at this history page. Here's a lovely paper bag card to make for her and fill with photos and/or special tickets, gift cards and notes. Do you make a special hand made gift for someone's Mothers Day? I am still blessed to have my mother with me so I do try to make her something special and different each year to show her how much I love her. This first project on this page was a special one. My siblings and I took her out to dinner and a show and then out to a special ocean trip the next day. I needed to store her tickets and itinerary safely and leave space for her to insert photos and other memorabilia later. So I made a paper bag card. The instructions are below. Another year I made her a handmade humourous greeting card. You can see this second project by scrolling down past the paper bag album and can have the instructions for making that as well. I saw how to make a very sweet paper bag card on a blog and immediately thought how perfect it would be for my project. In this case, the family wanted to give our mother tickets to some special events. A paper bag card would have pockets and flaps, perfect for storing the vouchers and tickets till the time to give them to her arrived. I took an ordinary brown paper bag and folded the bottom flap inwards to form a pocket, and paper pierced then hand stitched the edges of the flap down. I used a set of coordinating designer series papers from Stampin' Up! so it was not difficult to create a well put together effect. Then I folded the whole bag in half and paper pierced then hand stitched down the spine of the card. I scallop punched the flap edge with my Stampin' Up! scallop edge punch (retired) before covering the flap with some Daffodil Delight cardstock. I made some accordion fold flowers to adorn the front and polished them off with some pretty Vintage brads from Stampin' Up! There's still a pocket in the front section formed by the top of the paper bag. I put the vouchers and tickets in that and the journaling tags in the bottom flap pocket. I made a tag for each of my siblings to write their special messages on, too, since this was a joint gift between us all. I was not sure I had finished decorating the card. In the end I took a picture of all of us helping her to celebrate and added it to the card the day after Mother's Day. I made some tags for each person at the party to write on so she had a pocket full of cards to read over and over. Maybe your mother loves jokes? I made a humourous card for mine with the Pun Intended stamp set. It did make her laugh! On the card front I made a lighted lamp by laying down a circle of Daffodil Delight ink with a sponge on some Whisper white cardstock. Then I stamped the lamp in Basic Black over the top. 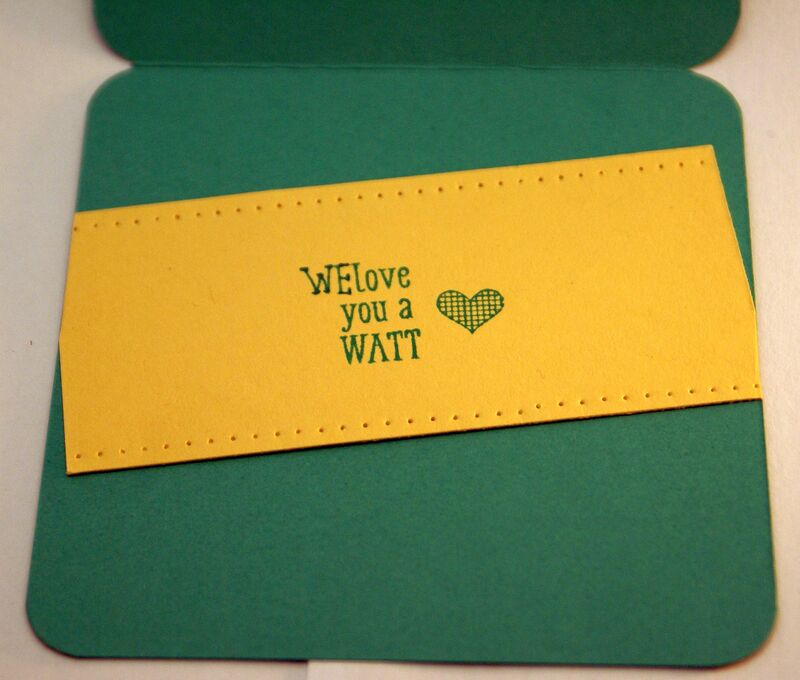 Next I added a sentiment from the Teeny Tiny Sentiments stamp set and heat embossed it in gold. Some of the embossing powder stuck to the light switch! I thought that was a happy accident and made the lamp look really special. So I added some rhinestones to the neck of the lamp as well to really bling it up.I also coloured the shape under th elight in Melon Mambo ink. Now I turned to my card base which I made from Emerald Envy cardstock. I wanted a feature along the bottom so I scallop punched the front, adding a strip of So Saffron behind it to line up with the back of the card. I stamped little hearts along the base in Emerald Envy and used my Paper Piercing tool to add some little holes in a line. Next I mounted my image on Basic Black cardstock and then onto the card base. I thought it was a cute card! You can also get inspiration from the Cards For Troops drive. We made hundreds of cards for the military to send home to their Mums! 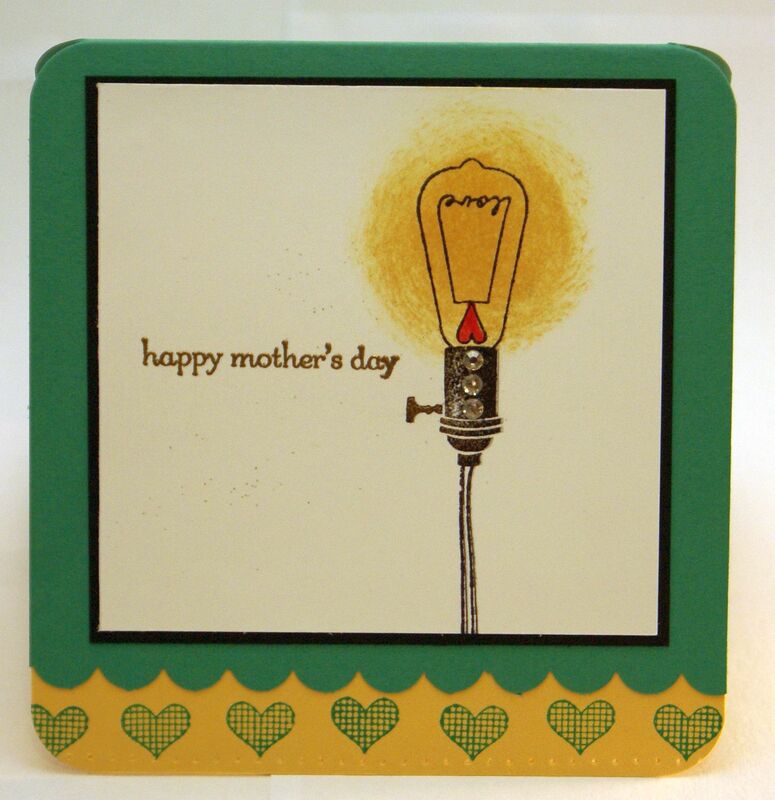 If you have a special project you are making for Mother's Day I would love to see it. Please do share.